Part of an occasional series where I visit museums that are open to the public, but only if you have contacted them first and arranged a time to visit. 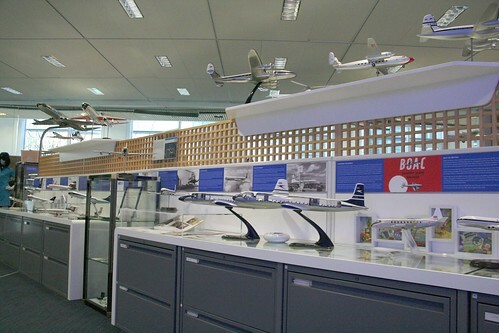 The British Airways Heritage Collection is based at the airline’s Head Office building and was formed to preserve the records and artefacts of British Airways predecessor companies: BOAC, BEA, BSAA and the pre-war Imperial Airways and the original British Airways Ltd. Maintained by volunteers, the museum occupies a fairly prominent location on the ground floor next to the building’s famous “indoor street”, which is not surprising when I learnt that a lot of the visitors are the local staff wanting to have a look around. Like many transport oriented museums, it is actually the archive that is of most interest to most of its users, and there are two floors of documents in the basement. What the casual visitor gets to see is a decent sized room laid out with a timeline of the various companies that merged over the years to form British Airways as we know it today. One of the volunteers, Keith offers tours around the museum, which is essentially up to an hour of the history of the company. Something he knows a bit about having worked for the airline all his life. The early days of flying is an odd combination of the heights of luxury being provided inside an uncomfortably shaky tin cans flying comparatively slowly just a couple of thousand feet in the air. With limited fuel, most flights would be short hops during the day, with passengers staying in hotels overnight. Despite the discomforts, the ability to turn a 6-week cruise into a 10 day flight meant the aircraft gained a lot of custom from HM Government for ferrying its postage and diplomats around – and celebrities. Naturally, WW2 got in the way of civilian transport, but it was a boom time for the development of the aircraft in terms of technology and most famously leading to the jet engine. One display talked about the Air Transport Auxiliary, the civilian body that during the war flew aircraft from factory to airfield. During the war, over 300,000 aircraft were delivered – which is quite a staggering number in itself. Another civilian group flew deliveries of ball bearings from factories in neutral Sweden. After being constantly attacked by German fighters, they ended up being given Mosquito jets planes — the only civilian use of fighter jets — for their speed, and thus the only ones to be painted in civilian colours. A memorial case is given over to aircrew who have been awarded medals of honour, including Jane Harrison, the only woman to have been awarded the George Cross during peacetime. As the war ended, civilian aircraft were able to take advantage of the wartime developments and ever larger models were developed. Sadly, Britain’s de Havilland Comet was just too early a development and a couple of crashes set back British airline manufacturing. At the time, flying was still an expensive luxury, which in turn also contributed its glamorous image – particularly helped by being the era when celebrities dressed glamorously instead of in jeans and t-shirts. 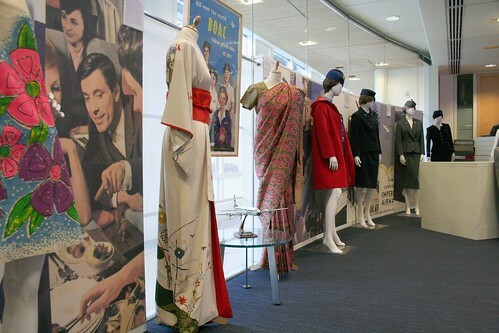 The airline staff of the time also dressed appropriately, and one of the museum’s more popular archives is the stewardess’s uniforms. I suspect, personally, that for many of us, flying regularly is something done in the heady years of early adulthood, and when settled down, the familiar uniforms of that period evoke memories of childless times. Your favourite “BA Uniform” is potentially as much an indicator of your age as which Dr Who you grew up with. A bit of space is given over to Concorde, but not as much as you would expect for the flagship of the airline – most of the post-80s display is about mass transport as airlines dropped the luxury image and became flying buses delivering people from A to B in an increasingly cheap and tawdry manner. While the increasing availability of air travel is undeniably a great thing, I do slightly miss the exclusive glamour of the past. Talking of glamour, it was a BOAC flight that conveyed The Queen from Kenya to the UK 60 years ago. 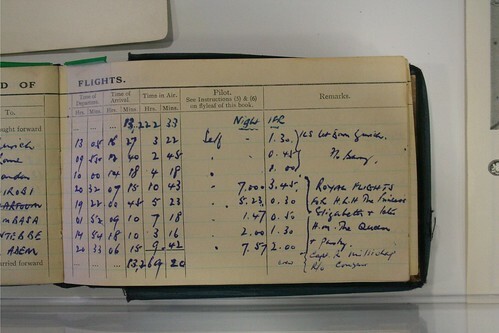 A display case has the flight log from the plane noting when it switched from normal plane to Royal Flight. And I think we’ll gloss over the appalling episode with the strangely decorated tailfins. One thing I noticed on the displays though was a collection of displays of ashtrays. Their design followed the contours of fashion as tightly as the clothes and music of each era, and are oddly evocative of the past. Thanks to Keith for taking time away from his research work and given me his third tour of the day – it certainly added a lot of background to the airline’s heritage. I was there for about 90 minutes in total, and a dedicated fan could probably spend even longer there. I expect children will love the models – this big child certainly did. Some more photos of the displays here. They also have some examples of aircraft seating next to the museum, so if you want to have a chance to sit in 1st class for the probably only time in your life, then here is an opportunity. The museum is open Mon-Fri and the best way to arrange a visit is by emailing them at ba.1.museum@ba.com. Visits are free, but donations are appreciated, or they sell some posters and postcards featuring old adverts. If arriving by public transport, you can use the staff bus from Heathrow airport, which is a nice courtesy. Nice article – but Mosquitos weren’t jet planes! Some of us quite liked the World Tails. Matter of choice, and each to their own! 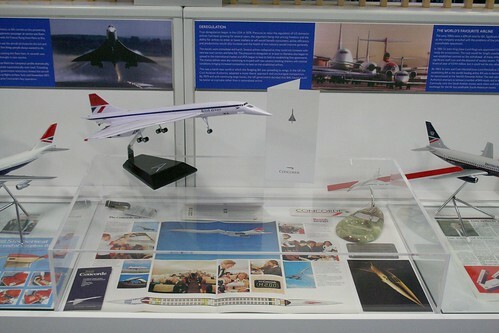 Much of their collection used to be on public display in the old Heathrow Visitor Centre on the Bath Road – such a shame they shut it. You managed to get in quick; it only reopened late last year after an ‘extensive redevelopment’. The museum seems to be most popular with BA staff (or it was when I visited its pervious incarnation as the ‘Speedbird Centre’). Great that it is still free to visit. My first flight in a plane was in a BOAC DC-7C, July 21st 1957 from London Airport (North) to Idlewild (NYC), departing as scheduled @ 23:30hrs with onward bookings to Adelaide. South Australia. I was one of a party of approx 32=36 RAF personnel. Another similar party followed on the lflight the next day. (A celebrity abroad our flight that evening was Cyril Stapleton. Leader of the BBC Show Band). I would like to commemorate the occasion by visiting your museum’ Woulld it be possible for me to visit next Tuesday (21st) arriving about mid-day/early afternoon. I would be travelling by coach from Essex. I will be in London next month for a few days. I will be glad to visit your museum. Where are you located ? I’ve searched the internet for days now trying to find a contact for BOAC History, but it’s an almost hopeless task – I hope you have an answer. My Father was Captain G.G. Liles DFC, of RAF 214 & 220 Squadrons, then BOAC, then BA, born 1920, died 2006. We were a ‘posted family’ to Montreal, Canada, 1947-1948, the were returned to England for my Father to train with many others on the Boeing Stratocruisers at Filton. For that to happen, a lot of crew families were placed around Bristol, and ours with several others were placed on a new estate at Westbrook Road, Brislington. I know the names of all the other crew members & families who were there with us, when I was aged 2 to 11 years. I am currently writing about that time in Brislington in the ’50s, and it’s rather disconcerting to hear from a lot of today’s residents there about a “Legend” that the estate was originally there ‘for a load of Canadian Airmen’, when to my knowledge all but one were British. – Is there anyone I can contact to discuss this ? WHY NOT !!!? – Why the hell are BOAC records so difficult to contact ! Our family was part of BOAC for decades !!! I’ve already given my name, email address, website and message ! Is there ANYbody there !? I would like to visit the heritage collection. My father was a Captain with BOAC and my aunt one of the first stewardesses with BEA. I worked as cabin crew for 11 years. apart from interest in the collection, I would like to donate some items I inherited from my aunt – eg her 25 year pin. If someone could tell me how to make an appointment, I would be grateful. The details about how to arrange a visit are clearly stated in the article. 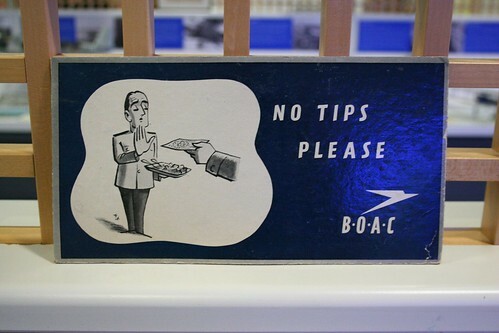 Just such a great shame the BEA/BOAC aircraft were lost from the BA Museum at RAF Cosford.